Ealing beer festival is the largest outdoor London CAMRA beer festival, held in Walpole Park Ealing and kicking off the Ealing Summer Festivals season. 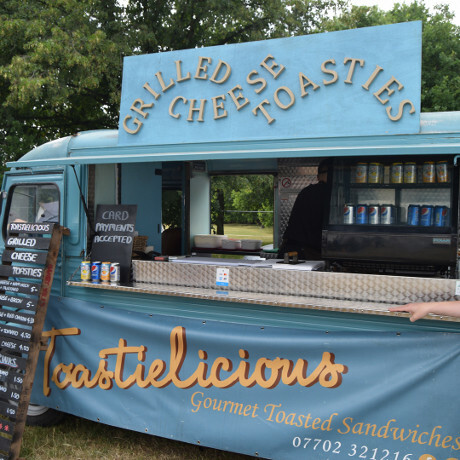 The festival features over 500 real ales, ciders, perries, wines and imported foreign beer. The drinks lists will be available here towards the end of June. In addition to beer we have a range of ciders and perries which have been carefully selected from small and medium producers. We also offer a selection of English wines from grapes and other fruits. A range of soft drinks is also available. Free water is available from all bars. We operate a beer card system for payment at the bars to improve the speed of service. Cards are available at admissions and token points in the bar. Note: beer cards cannot be used at food traders. Any remaining credit is fully refundable at token points, or may be donated to charity. Admission and beer cards may be purchased by cash or using debit and credit cards including contactless. Cash back is also available. Unfortunately our machines do not currently accept AMEX. The real ale beer list is now available, the full programme with tasting notes will be available before the festival opens. As ever, we had a good range of imported beers selected by Bar Manager Adam Miller from his wide personal knowledge. We have English wines made from grapes and other fruits, selected by our Wine Manager, Paul Saunderson. In addition a selection of house wines and meads are also available. In line with CAMRA policy, our beers are served in oversized, lined glasses - both pint and half pint glasses are available. Beer is served in 1 pint, 1/2 pint and 1/3 measures. Are we showing the football? Are children allowed at the festival? What soft drinks do you have? Click below for full FAQs. Free tap water is available at the bars. Other soft drinks may be purchased from the foreign beer bar of from food vendors. You are welcome to bring in to the festival you own food and soft drinks. We are afraid as a licensed venue, we cannot permit any alcohol from outside to be consumed within the venue, it’s against the law. Will you run of beer? Not this year! Historically beer levels have been quite low on Saturday, however this year we have over 5,100 pints extra, and have breweries on hold for further orders if required. We attempt to provide sufficient seating but there will never be enough for everybody. If dry you may wish to sit on the grass, otherwise feel free to bring a blanket. 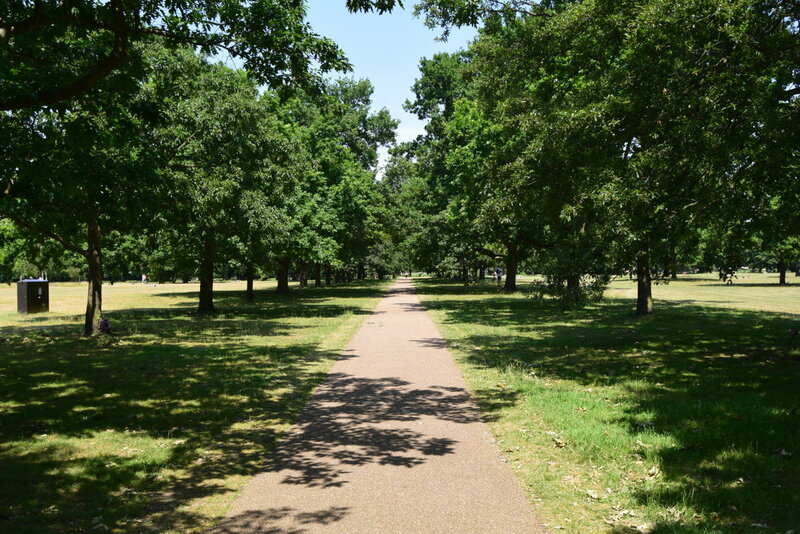 (note this year after the extended dry period the grass is quite dusty – we advise you bring a blanked if sitting on the grass). Will I need to queue? We have to operate to a strict limit on numbers in the festival. At peak times, i.e. after 5pm on weekdays there may be a short queue as we process admissions, we aim to keep queuing to a minimum and queuing time rarely exceeds 8 mins. If we are extremely busy we may need to introduce a ‘one out, one in’ policy and you may have to queue for longer, we hope that you will accordingly appreciate why this is. This year we are offering advanced tickets, which will offer guaranteed priority entry in a fast track queue. Advance tickets are available here. Our staff have the same legal rights and obligations as pub licensees and can refuse admittance. For security reasons a bag check may be required. We also require proof of age for those under 25. Anyone who is behaving in a way which is likely to cause a danger to others will be removed from the site. Will you be showing the World Cup semi-final on Wed (or any sporting events)? We are sorry we are unable to show any sporting events, including the World Cup due to capacity and potential public viewing rights required. Children are allowed in free until 6pm, if accompanied by an adult. Children must be accompanied at all times by a family member over 18 years old. For safety reasons we request that all children leave the site by 8pm, or shortly after. Baby changing facilities are in the disabled toilet. If unpaid volunteers are running the festival why are your drinks the same price as pubs? Running a festival of this size has significant infrastructure and park hire costs, even though none of our volunteers are paid! Beer and Ciders are priced in-line with CAMRA’s pricing policy. How much are your beers and ciders? All our beer is purchased from the breweries or beer distribution companies on normal commercial terms. 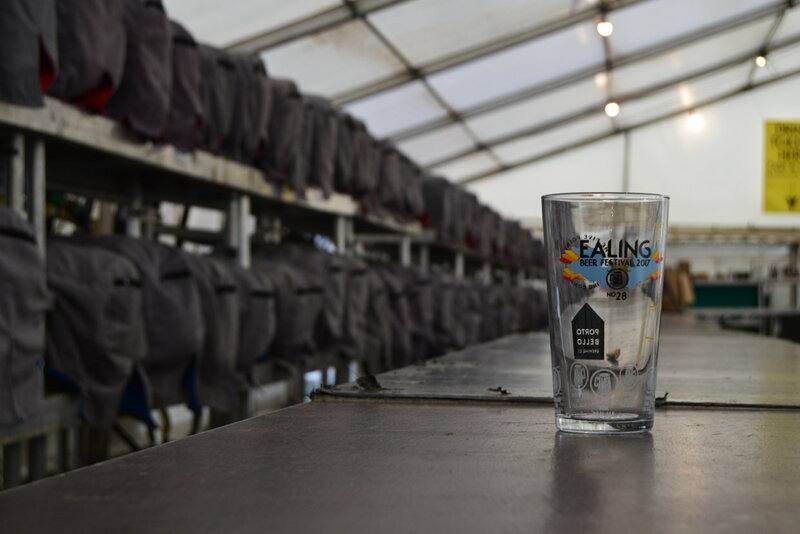 Ealing Beer Festival follows CAMRA guidelines in charging what is reasonable for the area without seriously undercutting local pubs or excessive overcharging. How do I pay for my drinks? We operate a beer card system for payment at the bars to improve the speed of service. Cards are available at admissions and token points in the bar. Note: beer cards cannot be used at food traders. Any remaining credit is fully refundable at token points, or may be donated to charity. Beer cards may be purchased by cash or using debit and credit cards including contactless. Cash back is also available. Unfortunately our machines do not currently accept AMEX. What is the advantage of advance tickets? Advance entry guarantees priority entry in a fast track queue. Can I leave the festival and return the same day? Yes, please ensure you obtain a pass-out wristband from the admissions area before leaving the site. You can then come and go as many time as you wish during that day. From the Hertfordshire countryside comes a gourmet range of soft and hard cheeses made in small batches from milk produced fresh on the farm. Wobbly Bottom will also be offering fresh Panini's and scotch eggs. Traditional goulash, spicy fried sausage and langos (deep fried flat bread with option of garlic, cheese and soured cream). 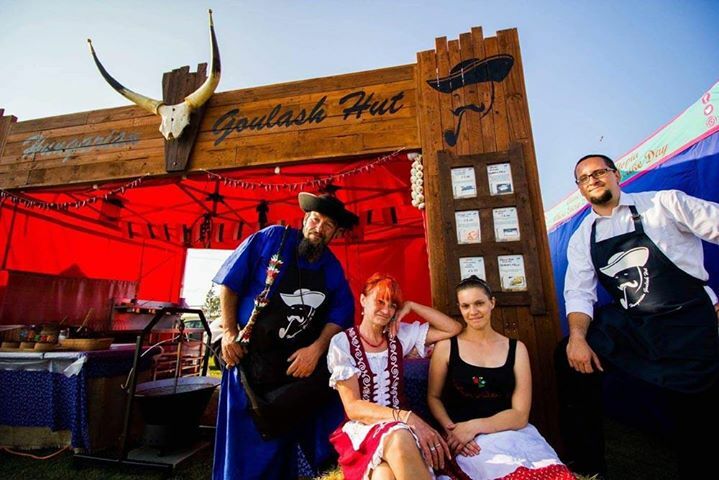 The Goulash freshly cooked in cauldron from best quality beef and vegetables. 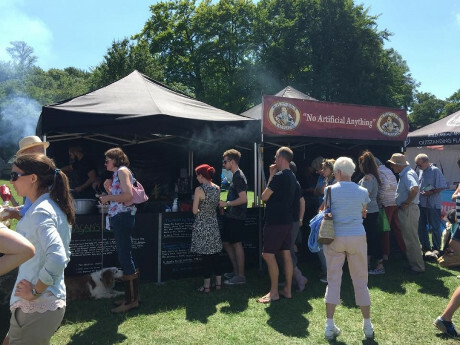 The ever popular Crusty Pie company returns with their range of traditionally made pies, gourmet rolls and pork scratchings - watch out for the spicy ones! 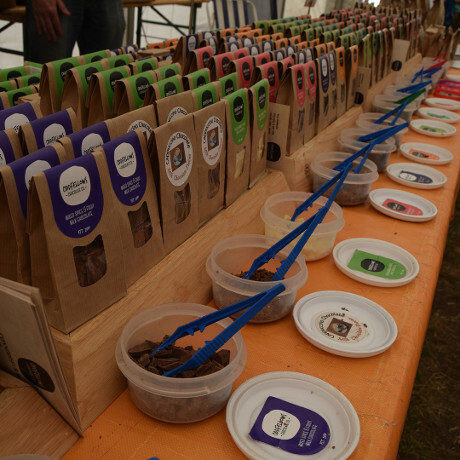 Oddfellows return with their huge variety of quality hand made chocolates, including their Scorpion Death Chilli Dark - you have been warned! 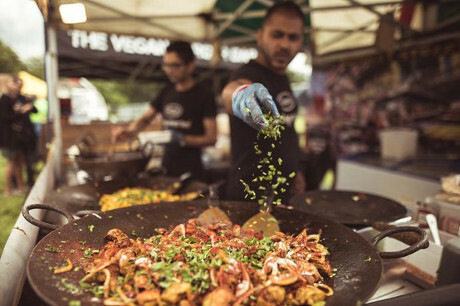 We welcome back Gupta this year with their delicious range of meat and vegetarian curries and Indian street food. 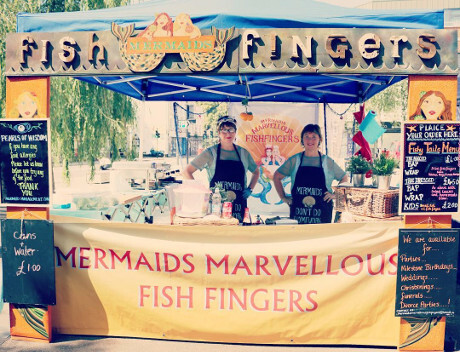 Mermaids Marvellous Fish Fingers run by Katie and Carolyn will be serving wholesome fish finger baps and wraps with their homemade slaw and tartar sauce. Sourdough grilled cheese toasties are crunchy & gooey with an epic crusty cheese edge that just makes your mouth water. Meat and vegetarian options are available. 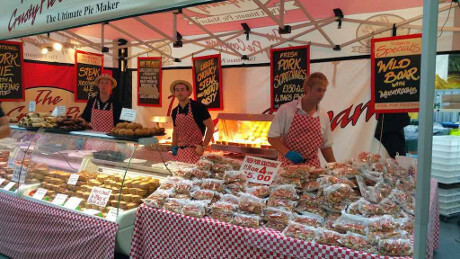 O'Hagan's BBQ, including a variety of handcrafted quality sausages with no artificial ingredients and whole hog roast. A veggie real ale sausage is also available.